Oh, madeleines…are you really cookies, or are you cakes disguised as seashells? Personally, I think these Vanilla-Brown Butter Madeleines are little cakes, but however classified, they are delicious. 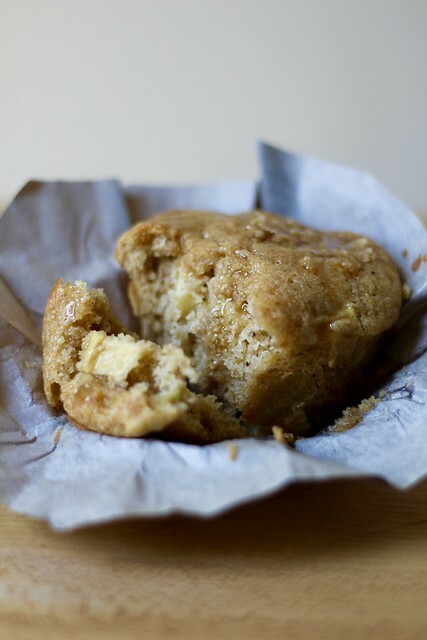 Vanilla and brown butter are two things that make everything better. I’d be happy with just one in a sweet, but both– wow! 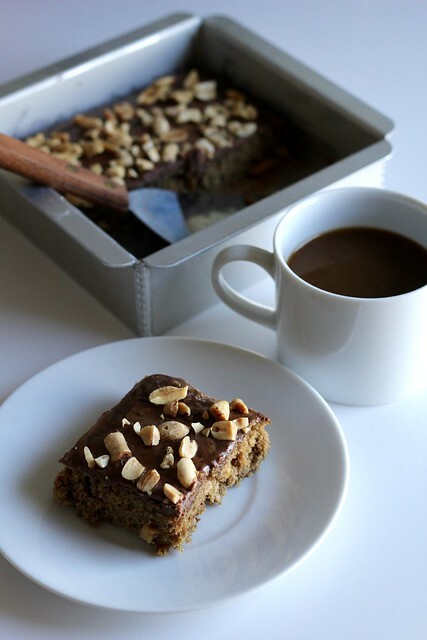 (Another great treat with this flavor combo is the Brown-Butter-and-Vanilla-Bean Weekend Cake from BCM.) 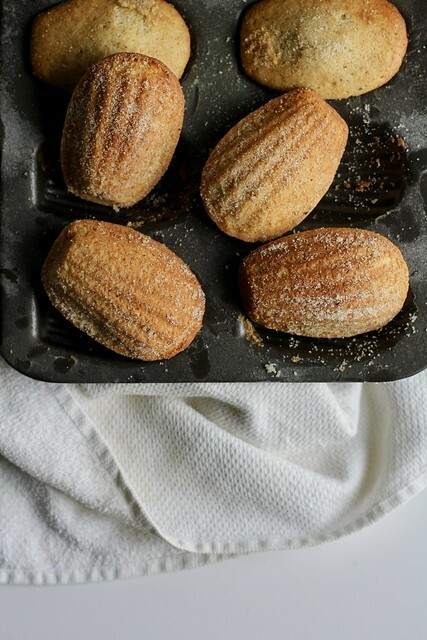 Madeleines are easy to make by hand, but you do need to allow for some chill time in the mold before baking, especially if you want to get the prized hump on the back. I got nice, gentle bumps on the backsides of these. I was pretty pleased with that, because the hump’s been hit-or-miss for me in the past. These have great flavor and texture, and I tossed them in some vanilla sugar while they were still warm. I have a one-track mind when it comes to sweets and I had been pushing to make this Moka Dupont for months. Finally, the time is now! 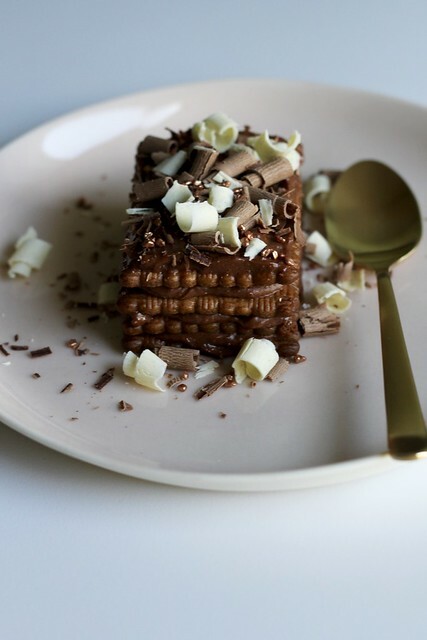 It’s an icebox cake– creamy chocolate frosting and store-bought cookies dunked in espresso– that melds together after a long rest in the fridge. Apparently it’s very popular in France, where it’s made with Thé Brun cookies (which I happily got to use myself because I asked a friend to bring me a packet back from a trip– my souvenir from Cannes!). Over here, Petit Beurre cookies make a good stand-in. The chocolate buttercream frosting is made with butter, sugar, egg and plenty of melted dark chocolate. 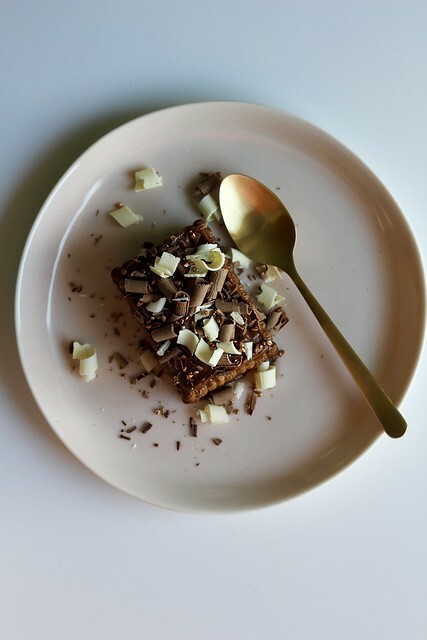 This is not a light dessert, but I am not one to complain about something being too rich, so I enjoyed every bite. You can assemble a big square or rectangular cake, or plate up individual ones like I did. I had some extra cookies and frosting, so I made each babycake four cookies high instead of three. After a night in the refrigerator, I had a lot of fun decorating these with chocolate curls (I used a vegetable peeler) and some wacky decor called “bronze crunch” that I picked up at Waitrose on my last trip to London. Yes, my cabinets are filled with food souvenirs from foreign lands…I know yours are,too. 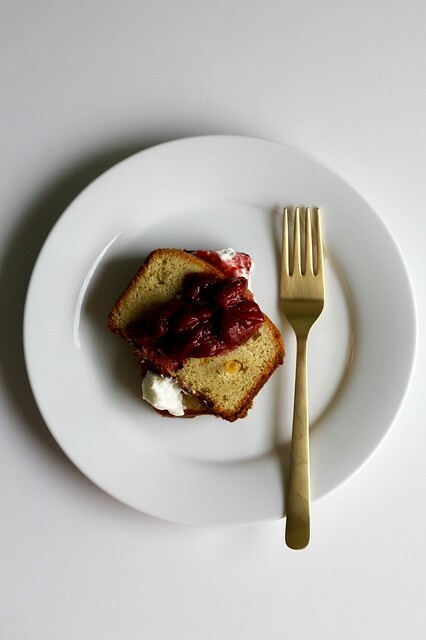 Double-Corn Tea Cake is a simple summer loaf cake that’s easy to put together and is great with fruit. This recipe is made with both corn kernels and corn flour (not to be confused with cornstarch), which is much more fine than cornmeal. I don’t know that I’ve ever noticed corn flour at the grocery store, but I found it from one of the millers at the Union Square Greenmarket. I’ll have to look for some more ways to use up the bag. I suppose you could serve this cake like cornbread, although it’s a bit sweeter and more buttery than what I’m used to. I liked it with roasted strawberry sauce and whipped cream and I’ll probably try it toasted with cherry jam, too. 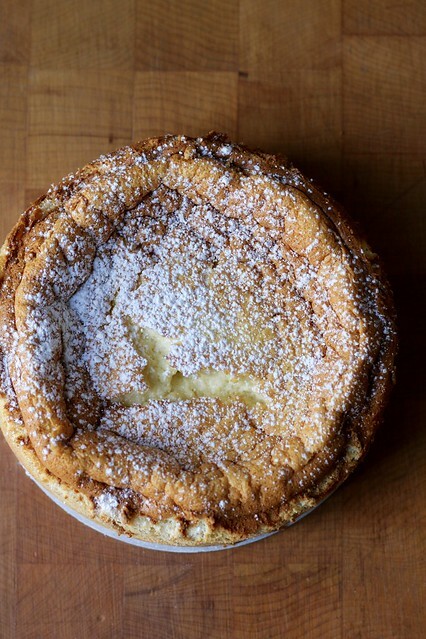 Martine’s Gâteau de Savoie is the kind of simple cake I’ll want to make all summer long. It’s the perfect thing to go with roasted strawberries, a pile of raspberries, sliced plums, whatever. 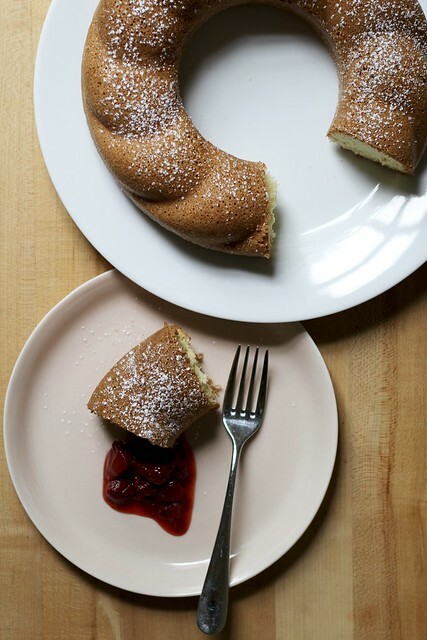 It’s an easy to make separated egg sponge– no butter, oil or baking powder needed. I baked mine in a mold that’s traditionally used for something I’ve never made called a trois freres cake, but a bundt pan will do nicely here. I have a jar of scented geranium sugar in the cupboard that I made quite a long time ago and always seem to forget about. I made a mental note to bake with it here, thinking that its light floral taste would go nicely with the roasted strawberries I would be serving alongside the cake. I was too embarrassed to photo the extra large blob of whipped cream I also spooned on top, but you can take my word that shortcake-style ain’t a bad thing. 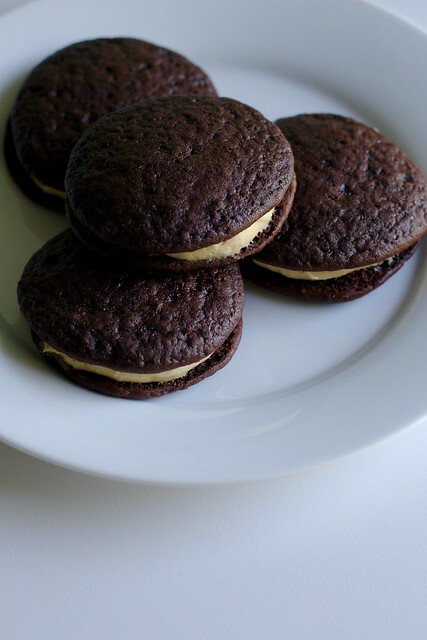 It doesn’t matter if they’re called Les Whoopies or whoopie pies, I’m a big fan. I used to work in a bakery where we made heaps of them (the chocolate and the pumpkin ones were my favorites), so I know my whoops. These are great– moist and chocolatey, like little devil’s food sandwiches, with peanut butter filling. I always like how good whoopee pie cakes are a little sticky on my fingers. Is that weird? I made these a few months ago actually, but now that I’m looking at the picture I took, I should go make them again! 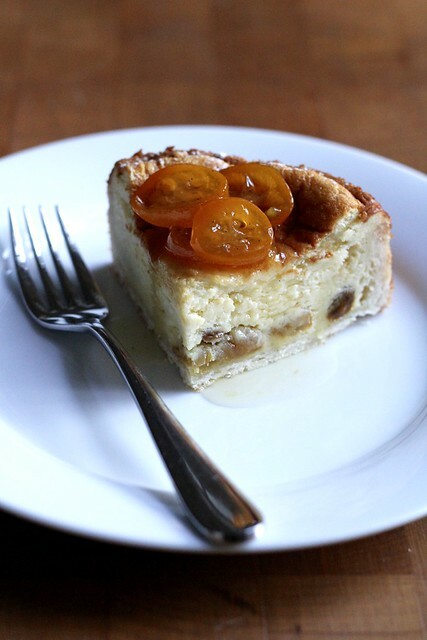 A year ago, the group made Dorie’s Tarte Tropézienne, a pastry cream-filled, sugar-sprinkled brioche cake. I did not. That’s why rewind week comes in handy. I’d never had a Trop before…now I know what I’ve been missing. I really like pastry cream. 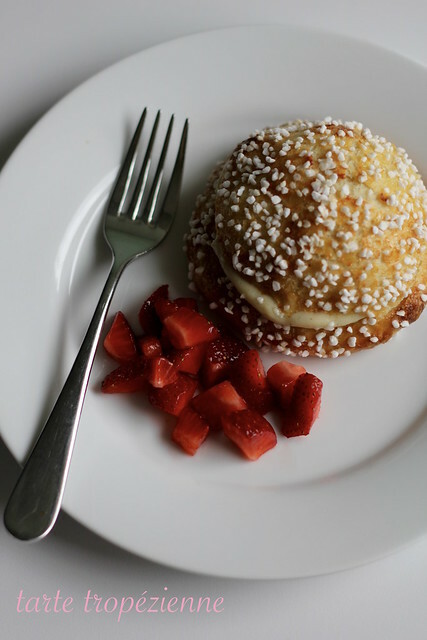 And brioche. Trops come in various sizes. I chose to make individual ones rather than slice up a large one. Mine came out looking a little more like burger buns than like the flatter cakes they should be…I clearly didn’t press the dough out enough. No matter, they were still delicious. 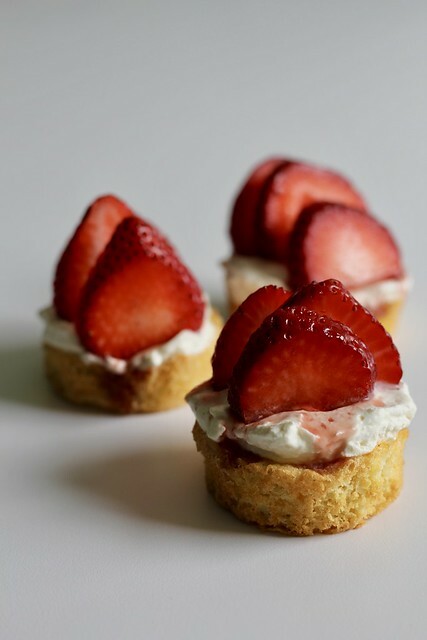 I served them with chopped strawberries alongside, but next time I may put the berries inside instead.